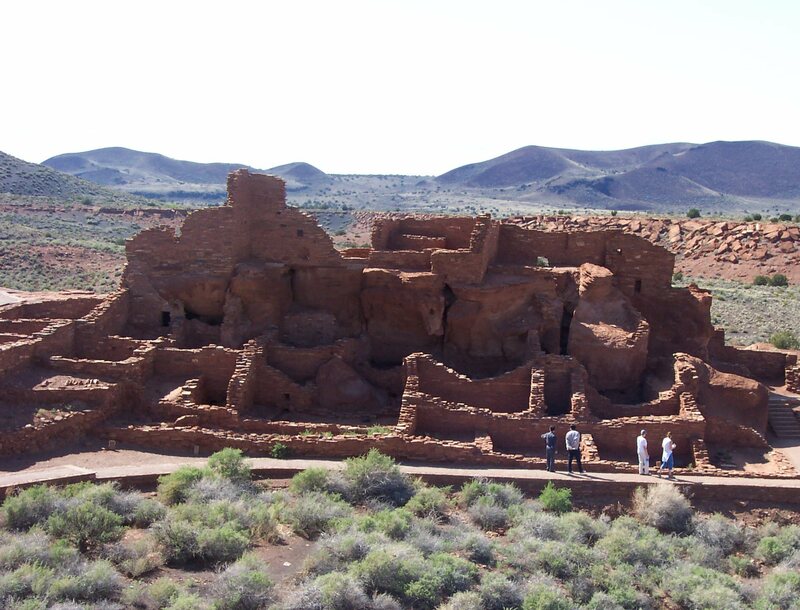 This Monument preserves the ruins of red sandstone pueblos built in the years around 1100 AD by the Sinagua and Anasazi people. Made of slabs of sandstone, limestone, and basalt, and held together with clay-based mortar, the homes were inhabited until about 1225. 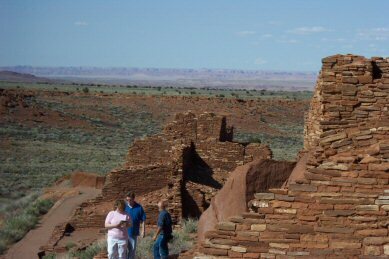 Located near Flagstaff, Arizona, Wupatki was the largest pueblo of its day. The modern Hopi are believed to be descended from these people. 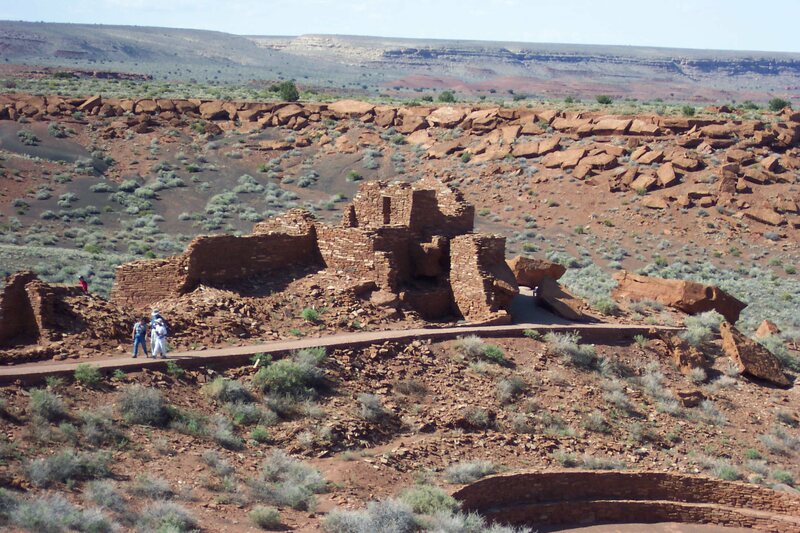 In 1180 thousands of people were farming on the Wupatki landscape. 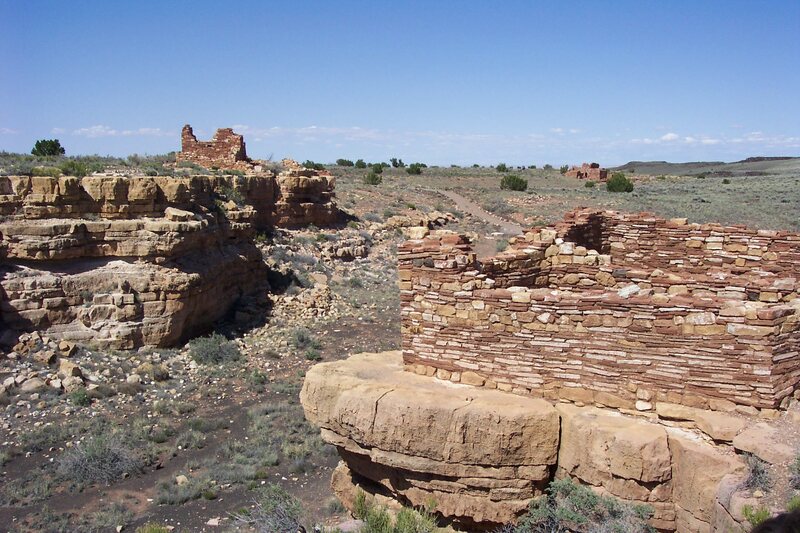 From a hill, today we can still see up to eleven sites where these ancient people built their rooms and dwellings. 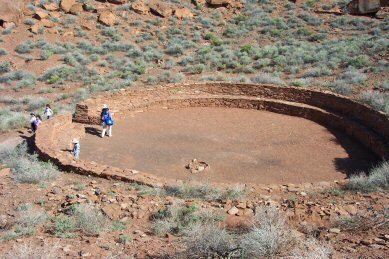 There is a driving loop that allows you to see four preserved sites. Nalakihu and Citadel Pueblos have simple walls, built upon rocky outcroppings that overlook a dry streambed. 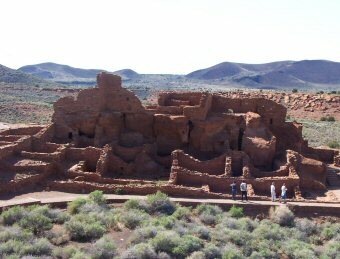 The Wupatki Pueblo, near the visitors center, is the most impressive. 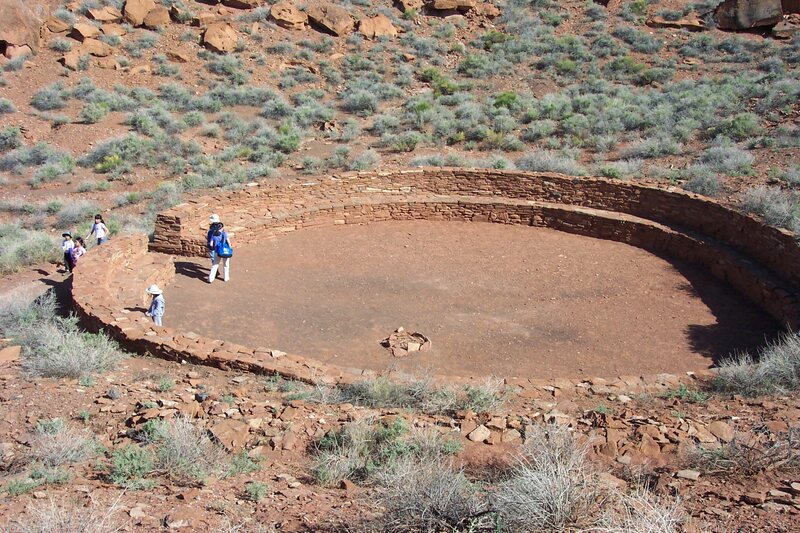 A large kiva-style room has been excavated, along with a ball-court and dozens of rooms. Self-guided walking tours are recommended. The visitors center has interpretive exhibits, and a book and map sale area. Camping is available nearby in Flagstaff, and in the Coconino National Forest. Last year I was at Sunset Crater Volcano National Monument, which is just miles away from Wupatki, but time contraints kept me from getting my Wupatki stamp! Can you believe it? 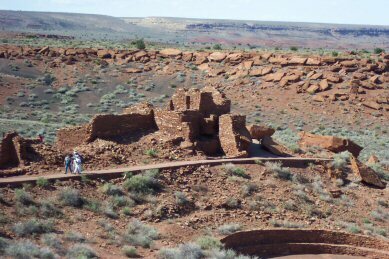 I rectified that recently, and drove the 35-mile loop that visits all the major Wupatki sites AND the Sunset Crater Volcano field. The drive is beautiful, stark, impressive. With Flagstaff's Humphrey's Peak to the southwest, and the Little Colorado's cliffs to the north and east, it's a drive to ease the soul. 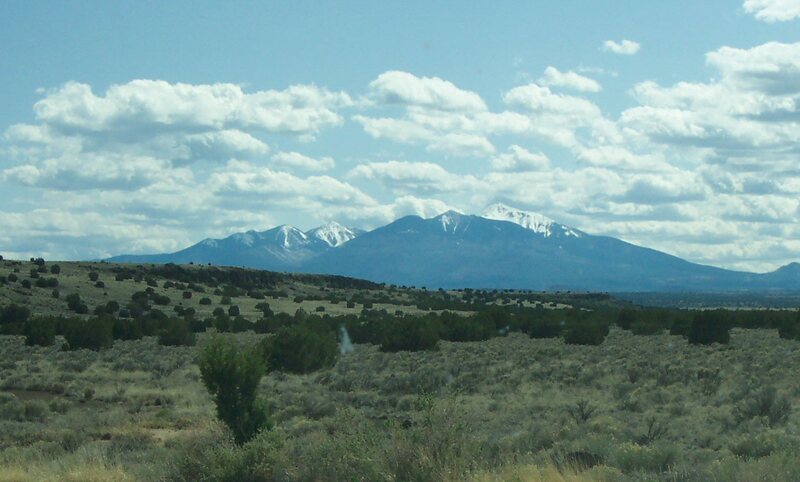 From Flagstaff, go north on Highway 89 for about 28 miles. The turnoff is to the east, and takes you directly to the Monument. Follow the half-circle road if you wish as it wanders south, then west, and rejoins highway 89 closer to Flagstaff; along the way, it will take you right past Sunset Crater Volcano National Monument.